The Sweet Shop, 28 Balantyre Street, London, c.1968. Clipping from unidentified publication. Painted facade by Martin Sharp. In 1967 designer Laura Jamieson opened a clothing and fabrics shop at 28 Balantrye Street, London, down the end of King's Road, Chelsea, and in the section of the city traditionally known as the World's End, adjacent to the Thames. Jamieson's venture was to be known as The Sweet Shop and at one stage it featured a facade painted by Australian artist Martin Sharp (1942-2013). The Sweet Shop operated for a year through into 1968. It then closed for a period and was relaunched in 1969, along with an outlet in New York. The London shop then operated through until 1970 when the original Balantyre Street premises were demolished to make way for high-rise redevelopment. It continued to operate at a different location into 1971. A detailed account of The Sweet Shop's brief history, including reminiscences by Laura Jamieson and reproduction of contemporary press and magazine cuttings from Vogue and the Daily Press, is to be found in the blog A Dandy in Aspic with the entry posted during March 2012. The Facebook page Epicentre of creativity - World's End Chelsea SW10 in the 1960s also posts material about The Sweet Shop and the period of its operation. In many ways The Sweet Shop was similar to other iconic King's Road, London, clothing boutiques and gathering places of the Swinging Sixties gliterati such as I Was Lord Kitchener's Valet and Granny Takes a Trip. The latter was owned and operated in part by artist Nigel Waymouth, a friend of Martin Sharp. It featured a changing shopfront with spectacular artwork. Waymouth was one of the major psychedelic artists of the time then working in London. The Granny Takes a Trip frontage was mostly the work of Waymouth, who, along with his partner Michael English, collaborated with Sharp on the production of two covers for OZ magazine during 1967-8. Waymouth is primarily known for his production of posters with English under the title of Hapshash and the Coloured Coat, and for his later work in portraiture. Once inside the shop there were huge floor cushions, wall hangings, and clothes hung from the ceilings and adorning the walls more like an art installation. It was a social hub and friends and customers mingled. They sat on velvet floor cushions, drinking jasmine tea while listening to sounds of Bob Dylan playing on an old record player hidden behind a Victorian screen. The scent of incense filled the room. It was all very atmospheric and exotic and fun, unlike the corporates fringing the King's Road today. Here Julie Christie, Twiggy and Justin, Jean Shrimpton, Lionel Bart, Syd Barrett, Jefferson Airplane, Tyrannosaurus Rex [Marc Bolan], Keith Richards et al. and local aristocrats and hippies mingled. 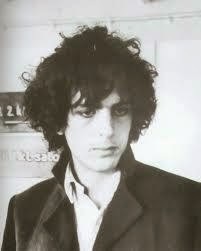 Syd Barrett at the opening of the Sweet Shop, London, 1967. It is obvious that Martin Sharp was one of the "local aristocrats and hippies" who encountered The Sweet Shop at some stage, and Laura Jamieson in particular. The original Sweet Shop frontage was boarded up and painted white when it first opened in 1967. The business operated as such for about a year. However sometime during late 1968, as part of preparations for a relaunch early the following year, Sharp - then resident in London at The Pheasantry, off King's Road - repainted the facade in his own inimitable style. The design featured a two-coloured background, possibly in shades of sky blue, with black outline and white figures running across the middle section. The centre piece was of a sheeted figure standing on a white ball with an inverted Vincent van Gogh chair on their head. At the time Sharp was art director for the London underground magazine OZ, though he also produced a number of posters for the Big O Poster company and exhibited his work in local galleries. Sharp's controversial and witty art displayed a detailed knowledge of art history and engagement with contemporary psychedelia. He was in many ways an Aussie larrikin, displaying irreverence and respect alongside each other in works such as the collage (see below) which combined Thomas Gainsborough's Blue Boy (c.1770) with Australian artist Russel Drysdale's streetscape of the dusty, dry outback Australian town Sofala (1947). The latter work was exhibited at the Yellow House, Sydney, in 1971 during Sharp's brief return to Australia. A contemporary photograph by Greg Weight shows the artist standing by the framed collage. Martin Sharp at the Yellow House, Sydney, c.1971. Photograph: Greg Weight. Martin Sharp had arrived in London around May 1966 following an overland journey from Sydney via South East Asia with his friend and fellow OZ magazine editor Richard Neville. He departed London at the end of 1968 and enjoyed a welcome home party in Sydney during January 1969, around the same time as the Sweet Shop relaunch. He returned to England mid 1969 before departing once again for home at the end of the year. A single black and white image of Sharp's Sweet Shop frontage art is known from an unidentified contemporary newspaper clipping. The photograph shows two children walking by the shop and a motorcycle parked out front on Balantyre Road. On the left is a garbage bin and some rubbish. The area looks run down, perhaps suggesting that the shop had been closed for a period and was in less than pristine condition. The photograph may have been taken to record the artwork at the time of its completion and just prior to the early 1969 relaunch. 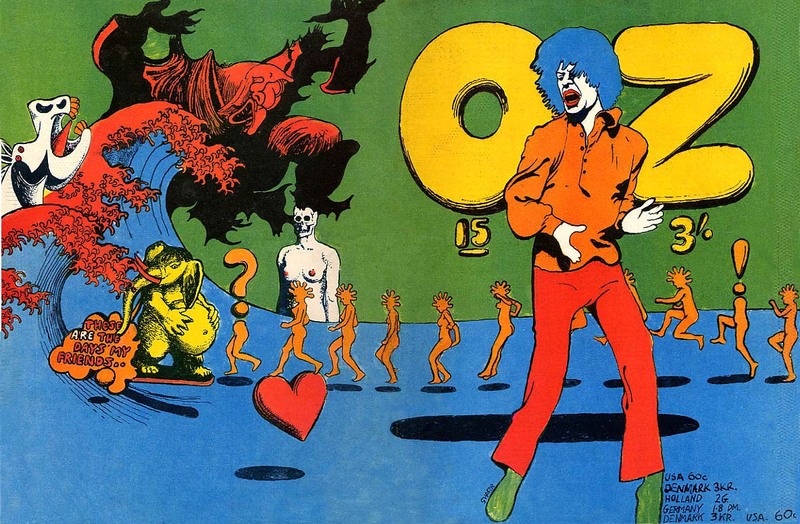 The motifs contained in Sharp's design reflect, in part, his cover art for the September 1968 edition of London OZ magazine (issue number 15). That work featured a veritable history of modern art, with Hokusai's Great Wave, Picasso's horse head, Magritte's skulled female figure, an India elephant idol, an adaptation of an early film strip of a man running, and Max Ernst's defining surrealist work The Fireside Angel, along with lipsticked pop singer Mick Jagger. The figures running right to left on the OZ cover, over a pale blue and green background, are similar to the Sweet Shop facade, only running in the opposite direction. It is possible that this blue colouring, and a lighter shade, were used on the shop front by Sharp, though the precise detail is not known. 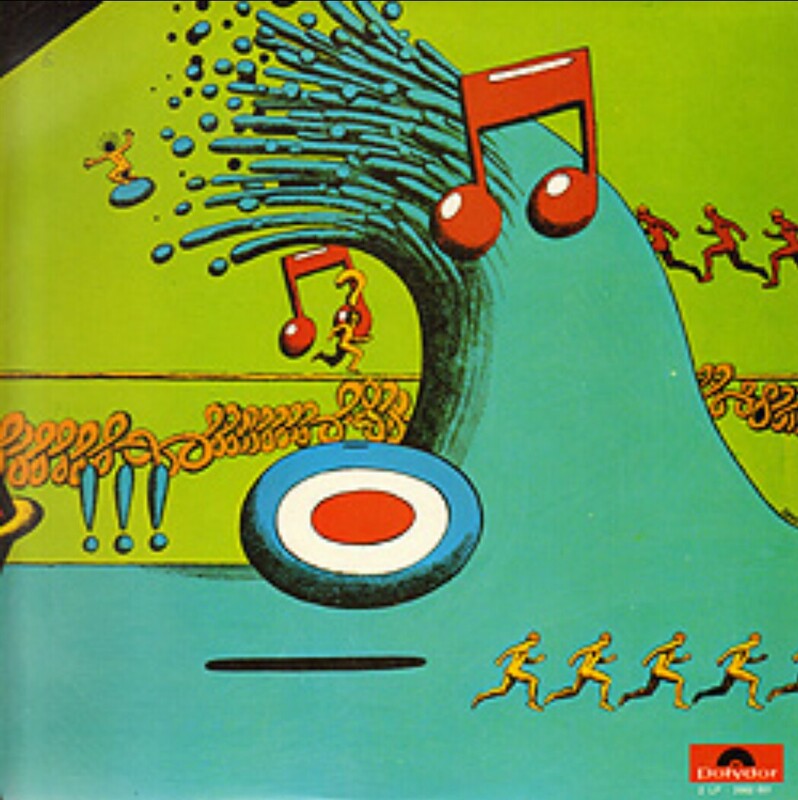 In a similar vein, the front cover of the 1970 double-album by former Cream drummer Ginger Baker's band Airforce features running figures over pale blue and pale green backgrounds. The Sweet Shop running male figures appear to have balloon-like coneheads, with bubble extensions, whilst those in the OZ magazine cover have star-shaped features on their heads and female bodies. Sharp's running figures are based on the famous Eaeweard Muybridge strip of motion study photographs from 1887 of a naked man running. The Running Man is seen artificially compiled into a YouTube film clip: http://youtu.be/Jq201Oi3UxM. The famous Vincent van Gogh chair (1888) - in this instance inverted for The Sweet Shop shopfront - was also a motif which featured in Sharp's art and collages from around this period. 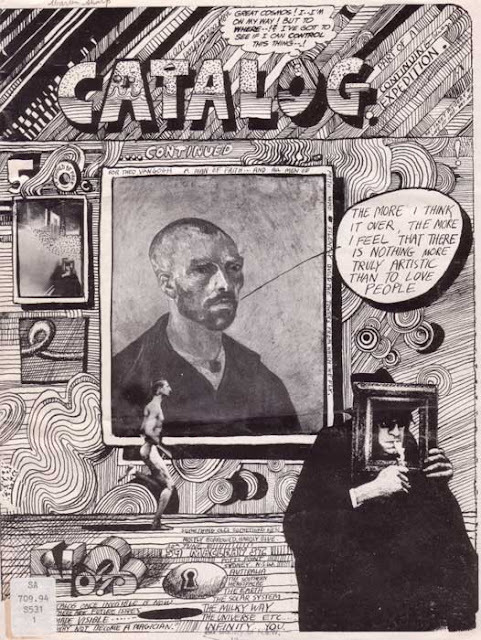 One of these was reproduced as the first image in his Art Book (London, 1972), being a catalogue of an exhibition of collages held in London during that year. 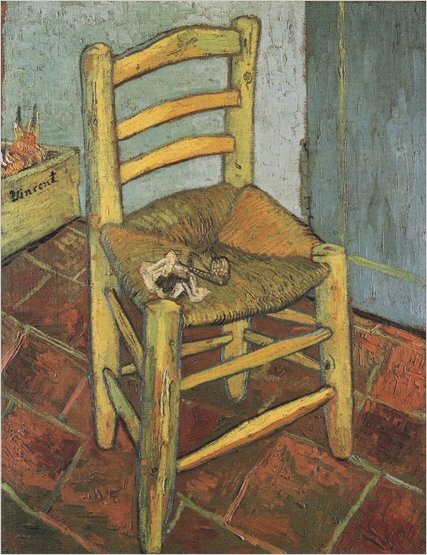 Vincent Van Gogh, Van Gogh's Chair, oil on canvas, 1888. Both the original running man and a portrait of Van Gogh appear on the cover of the catalogue of the exhibition of works by Martin Sharp held at the Yellow House, Sydney, in 1971. In this image the running man is naked as originally portrayed in the 1887 photographic strip, whilst Sharp himself appears in the lower right corner, dressing in black and lighting a smoke through a frame. The Sweet Shop facade is a little known, though a significant work of art by Sharp. It is one of his first major pieces of public art, with the face of Sydney's Luna Park - produced in the 1970s - perhaps his most famous work in this regard. Prior to arriving in London Sharp had undertaken a few set designs for local avant garde plays, however this was the limit of his large scale artwork. The Sweet Shop facade reflects a period during which Sharp was experimenting with simple design elements and blocks of colour, following on an intense few years between 1966-8 when his complex, psychedelic imagery was revealed through posters, record covers and graphic design within numerous publications, including OZ. He returned to these complex forms on a number of occasions - viz. the 1971 Yellow House catalogue - whilst also continuing to experiment and refine his use of colour and more simple forms. The Sweet Shop facade is a seminal work, produced at a time when, as noted by famous musician and friend of the artist, Eric Clapton, "Martin's art was out there." It was a confident though ephemeral work, and barring the discovery of an original preliminary colour sketch or photograph of the final work, the low resolution newspaper clipping remains the only surviving record of its short period of existence. Anonymous, 'The Sweet Shop and Chelsea in the 1960s by Laura Jamieson', A Dandy in Aspic [blog], 12 March 2012, available URL: http://dandyinaspic.blogspot.com.au/2012/03/sweet-shop-and-chelsea-in-1960s-by.html. Accessed 20 March 2014. Jamieson, Laura, Epicentre of creativity - World's End, Chelsea in the 1960s, Facebook. Accessed 20 March 2014.